Many hospitals are slashing jobs and cutting patient services citing Medicare cuts, the difficult health care landscape, and the Affordable Care Act as the reasons behind their decision. Over a dozen hospitals have announced job cuts in the past three weeks, the Washington Free Beacon found. Some hospitals announced they would close altogether, while others are downsizing and eliminating some of their services. Connecticut’s Lawrence + Memorial Hospital announced last week it was cutting 33 jobs, citing the "sheer magnitude" of payment cuts from both Medicare and Medicaid. "L+M and other hospitals are contending with massive structural changes that are happening very rapidly," hospital president and CEO Bruce D. Cummings said in a statement. "We are also experiencing unexpected—and previously unbudgeted—cuts in federal (Medicare) and state (Medicaid) funding. " "The sheer magnitude of the Medicare and Medicaid cuts impel us to look at all of our services and costs, including the largest component of our budget—personnel," Cummings said, citing a 20 percent cut in Medicaid proposed by Democratic Gov. Dannel Malloy and approved by the state legislature resulting in a $550 million hit to Connecticut hospitals. Sequestration also resulted in an additional $1 million loss for L + M this year. These cuts, said Cummings, are on top of the cuts already programmed into the Affordable Care Act. One source told the hospital that those cuts could result in hospitals receiving a $260 billion reduction in Medicare outlays between 2013 and 2022. Mike Farrell, spokesman for L+M, told the Free Beacon, with "all the challenges we are facing, we continue to do the best work we can do and make decisions on the current situation." He said, "these challenges aren’t going away, we’re looking at it as an ongoing situation." When asked if the hospital may need to make additional cuts once ACA is implemented, Farrell said, "we can’t guarantee anything at this time." L+M is not alone in facing financial difficulties. Arnot Health announced 83 full-time employees at St. Joseph’s in New York will be laid off, the hospital will be closing certain units, and some services will be eliminated beginning Sept. 23. "Serious operational challenges, including 2 percent Medicare sequestration cuts, cutbacks in other federal payments, Medicaid rate freezes, and the elimination of other Medicaid payments, have created an environment in which it is difficult to remain steadfast in our commitment—but we must, nonetheless," the company said in a statement. The NorthShore University Health System in Illinois announced it was laying off 1 percent of its workforce at its four hospitals to better position itself for changes that will result from Obamacare. "We continue to work diligently to ensure NorthShore remains well positioned to deal head on with the unprecedented changes brought on by the Affordable Care Act," NorthShore’s chief human resources officer Bill Luehrs stated to the hospital’s president in a memo. NorthShore said it did not have any further comment beyond the memo it provided. Mission Health Hospital in North Carolina announced layoffs of 70 employees. President and CEO Ronald Paulus wrote in a letter to hospital staff that while other area hospitals were laying off workers, Mission focused on "process redesign." The hospital cut just under 70 jobs, reduced the compensation of other officers by 13 to 20 percent, and Paulus cut his own compensation by 26 percent. Employer contributions to defined contribution plans will also be cut, and no merit raises will be given in 2014. Glen Cove Hospital on Long Island, N.Y., announced it would be closing its inpatient facility but has since changed course. Rallies by residents and criticism by local politicians ensued after the announcement. The mayor of Glen Cove started an online petition to keep Glen Cove a full-service hospital. NorthShore-Long Island Jewish Health System spokesman Terry Lynam said changing demographics in the community such as aging residents and a lack of growth in population were factors in the decision to reduce the number of beds at Glen Cove. "There’s been a lot of lead up to the decision to shift away from inpatient … many patients could be treated as outpatients," he said. The hospital will have a 24-hour emergency room, and if someone needs a hospital stay, they will be accommodated, he said. "More and more of our contracts will be risk-based contracts. The original fee-based contracts are getting phased out as part of the Affordable Care Act, and we realize the reality of the situation. We realize more care will be on an outpatient basis." The hospital is at "break-even right now," said Lynam, and wants to stay "ahead of the curve." He indicated that ACA is only one factor behind the decision. "I wouldn’t say that the Affordable Care Act is the only factor; it’s one factor," he said, noting that NorthShore has been shifting to outpatient care for several years. Citing the state’s decision not to expand Medicare under the Affordable Care Act, Vidant Pungo Hospital in North Carolina is eliminating inpatient care and moving certain services out of the hospital. Radiology, labs, and physical therapy will be transferred out of the hospital and offered at Vidant Medical Group physician practices. A new clinic will be built that offers multispecialty care, but there will be no inpatient care. The CEO reportedly blamed the state’s decision not to expand Medicare under the Affordable Care Act as one reason for closing the hospital. Vidant did not respond to a request for comment by the Free Beacon. The experience of other states suggests that Medicare cuts may not be the only reason layoffs and hospital closures are occurring. Connecticut is experiencing its share of layoffs at hospitals despite Gov. Malloy being one of the first governors to expand Medicare under Obamacare. Aside from L + M, Western Connecticut Health Network cut 116 jobs, and St. Vincent’s Medical Center cut 100 jobs. The Peninsula Regional Medical Center in Maryland announced 43 positions would be eliminated, as would be its Transitional Care Unit. The unit stopped accepting patients on Sept. 6, said Christopher C. Hall, vice president of strategy and business development, in an email. "The economic downturn has accelerated the push for efficiency," said Hall. 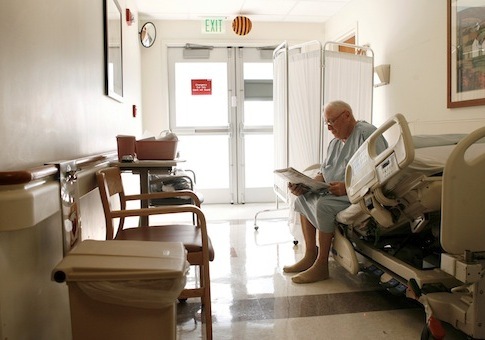 "At the federal level, Medicare reduction through sequestration has hurt all hospitals. For PRMC, that amounted to $4 million in lost revenue." The state’s Health Services Cost Review Commission granted hospitals a 1.65 percent adjustment in 2013, while inflation climbed 2.31 percent, according to Hall. Each percent the hospital falls behind inflation equals $4 million in lost revenue. "It’s health care’s perfect storm," said Hall, referring to a confluence of factors that are impacting hospitals. All are struggling to reduce expenses. "Tenants of the ACA are being felt across the health care industry. With less patients coming to a hospital, all hospitals must re-balance to the new reality of health care." Fewer hospital admissions and readmissions, pressure driving care from inpatient to outpatient, and the state’s regulation of the hospital in which it consistently awarded rate increases below the inflation rate are all part of the "storm." Other recent hospital layoffs have taken place at Indian River Medical Center in Florida, Baptist Memorial in Tennessee, Cortland Medical Center in New York, and Bethesda Health in Florida. St. Louis health care provider ConnectCare also announced it is cutting half of its staff. The Centers for Medicaid & Medicare Office of the Actuary predicted such decreases. "In the Office of the Actuary’s April 22, 2010, memorandum on the estimated financial effects of the Affordable Care Act, we noted that by 2019, the update reductions would result in negative total facility margins for about 15 percent of hospitals, skilled nursing facilities, and home health agencies," CMS wrote. By 2030, they predict a 25 percent reduction in facilities, and by 2050, that number will climb to 40 percent. This entry was posted in National Security and tagged Obama Economy, Obamacare. Bookmark the permalink.